British lager drinkers may be going soft. As sales of some of the UK's best-selling strong pilsners fell last year, a sea change may be taking place among the country's lager drinkers. So much so, the big brewers have raced to catch up with a new range of weaker brews. Could Britain's notoriously boisterous relationship with lager be calming down? A visit to any UK city centre on a Friday or Saturday night tells you all you need to know about Britain's drinking habits. The raucous crowds of very drunk young adults suggest that moderation is not the order of the day. While most of our continental neighbours seem able to politely sip on their alcoholic beverage of choice, UK drinkers appear to appreciate two things - speed and quantity. Nowhere is this more noticeable than in our relationship with Britain's favourite alcoholic drink - beer. Be it bitter or lager, British drinkers like to guzzle their pints. For this very reason, UK beer has historically been generally much weaker than that of our fellow Europeans. While the Germans have always liked their lagers around 5% alcohol by volume, or above, most British beers have historically been around 4% or lower - at least 20% weaker. This was so much the case, that when lagers first became popular in the UK after World War II, they were brewed specially weaker than on the continent to take into account the British propensity to drink a lot more pints in one sitting. However, things changed in the 1980s, when all the big brewers raced to introduce premium 5% lagers, which become immediately popular. Yet with British lager drinkers still drinking as fast, and as much as ever, it was perhaps not surprising that the phrase "lager lout" began to enter common vocabulary. Our national propensity for binge drinking can simply seem to make such strong lagers rather problematic. This may finally be dawning on the current generations of UK lager fans, with some of the best-known strong brands seeing a fall in sales last year, while those of weaker lagers have increased. Take Stella Artois, for example, the UK's best-selling lager, and at a hefty 5.2% alcohol never one for the faint hearted. 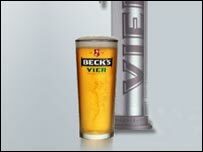 Its sales fell 5.7% last year, while those of Carling, the most popular 4% or "normal strength" lager, rose by 6.7%. While two statistics on their own cannot confirm a marked shift, what perhaps can is the fact that most of the multinational brewers have rushed to launch new weaker lagers during the past 12 months. 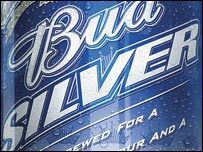 The Belgian-Brazilian giant InBev has released lower alcohol versions of its Stella Artois and Becks brands, called Peeterman Artois and Becks Vier respectively, while US giant Anheuser-Busch has brought out Bud Silver. All are around 4% alcohol by volume. Coors, the American owner of Carling has gone even further, and produced a 2% version of Carling, called C2. In each case, the firms say that the beer tastes as good as its original sibling, just weaker. And remember, the weaker the beer, the more a drinker may be able to consume, and the more the brewer can earn. 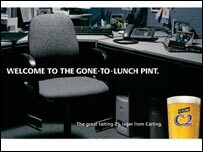 Carling for example, says that C2 will enable drinkers to enjoy "more pub time". "We understand that people are busier and therefore need to fit socialising in with other activities," says Coors sales director John Holberry. "This means that the beers on offer are not always the appropriate strengths. "Carling C2 is pioneering the mid-strength category, allowing consumers to enjoy a great tasting 2% lager from the nation's biggest lager brand, and landlords to increase their profits by opening up new drinking occasions and extending existing ones." Max Hastings from the British Beer and Pub Association said his members welcomed the trend towards weaker lagers. "What is really positive is that drinkers are getting an increasing range of beers to choose from," he says. "Britain has always had a tradition of weaker beers than the continent and this is somewhat of a return to that. "However, 5% lagers will of course remain popular." A spokesman for Alcohol Concern says that while the organisation welcomed the weaker lagers, it still urged drinkers not to be complacent. "Our concern is that people shouldn't see the weaker lagers as consequence-free drinking," he says. "We urge consumers to look through the hype and realise that in the end lower strength beers are still alcoholic, and you will still get drunk if you drink enough."